This is not a cliché question. It is of vital importance—especially in this current political climate. We have unique opportunities to speak with powerful voices and we should do our best to make the most of it. We all want to stand out in the crowd and be noticed. We write blogs, we do interviews, we visit schools and conferences. Often, it seems that we are desperately spilling out information, no matter what it is, just so we can keep a presence out there on the internet—because everyone else is, right? There are plenty of cause out there and we are easily pulled in a million directions without making a lasting impact in any of them. It takes all of a few seconds to go on Facebook and sign five petitions. It’s something quite different to go out in the trenches day in and day out and do the work. By taking up a cause that we care about and promoting that cause rather than ourselves, our writing can achieve greater credibility and promotion—and we get to help others and feel good about it, too. But how to decide what cause? It could be something that challenged you as a child, such as an illness, or being a foster child. It could be something that currently challenges you as a parent, such as the educational system or drug abuse. It could be something that you have found gives you strength, such as your faith or a fitness regime. The list is endless. You can start by reaching out in your own community. Offer to volunteer at a community center, to speak at a parent meeting at a local school, or in a church, a gym, a synagogue, wherever. Taking that first step might be challenging, but it means that doors will open. Your circle of connections will expand. And a natural by-product will be that your art and your writing will be enhanced. First and foremost, your local community. http://www.idealist.org connecting idealists with opportunities for action. http://www.handsonnetwork.org here, you can search for opportunities by type and location. If you are attending a residency, offer to work with the local community in some way. I love helping kids to find their own strong voices and connecting them in unexpected ways. I first did this in 1995 by co-founding InsideOUT Writers, a creative writing program for incarcerated youth in Los Angeles. In 2015, I started a program called MY WORLD PROJECT, connecting children in remote and/or war-torn areas around the world. I just returned from one month in the Sahara Desert, where I was invited on a sponsored residency. I might not have taken a real shower for a month and it was freezing at night, but it was worth it! This is why the emphasis is on finding a cause that you truly care about, because it might require a bit of self-sacrifice. Promotion as a writer or an artist is a bonus. It widens your audience of readers, expands your connections—and you get to make a difference. More than anything, it INSPIRES your writing! As artists and writers, we have unique opportunities to change the world. Open your mind and heart to the ways in which your actions might influence a wider audience. Once you step through that door of possibility, you will be amazed at what will present itself to you. Karen Hunt aka KH Mezek is the author and/or illustrator of nineteen children’s books, numerous essays, and the YA Urban Fantasy series, NIGHT ANGELS CHRONICLES, published with Evernight Teen. She is an English teacher with 51 Talk in China. 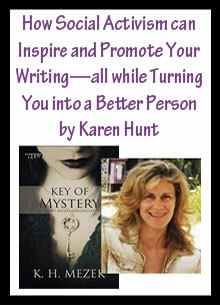 Karen has devoted her life to creating writing programs for youth. She is the co-founder of InsideOUT Writers, a creative writing program for incarcerated youth, and the founder of the MY WORLD PROJECT, connecting youth in remote areas through art and writing. She is a 2nd degree black belt in Tang Soo Do, a first degree brown belt in Eskrima, and a boxing and kick-boxing trainer. As a child, her family escaped out of Egypt right before the 6 Day War, lived in a 17th century castle in Switzerland and smuggled Bibles into communist countries, to name a few of her adventures. As an adult, she continued her adventures, living between London and a village in Yugoslavia. Currently, Karen is traveling the world with a small suitcase and her laptop. From the Sahara Desert, to Istanbul, to the Andes and beyond, her travels are inspiring her writing.